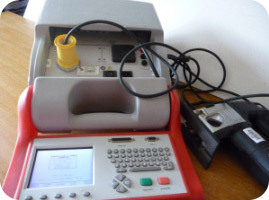 PAT Testing Prices Guide - keeping your PAT testing cost down! We pride ourselves on a flexible and competitive pricing structure to provide low PAT test prices to meet your exact circumstances and keep the cost of your PAT testing to the minimum. As our services are tailored to your exact needs it enables us to ensure our PAT testing costs are kept low. We can carry out PAT testing from as little as 99p per item or we are also able to price on a Day Rate basis in some circumstances if it can provide lower pat testing costs to you. The costs will be dependent on factors such as your location and number of items that need testing. Our highly competitive low cost minimum charge for on-site testing is only £60.00. We believe our cost effective PAT testing prices represent good value to you or your company considering the implications of not complying with electrical and safety regulations. When contacting us about our costs for testing it is helpful to have a good idea of how many appliances you have that need to be tested. Remember, portable appliances are easily identified as any appliance that has a plug attached to it and plugs into a wall outlet so any computers, monitors, printers, kettles, leads, cables and other similar items should be tested. For a quote on our PAT testing prices please contact us online or by phone on 0118 962 3451. Our claim of cheap PAT testing relates to our lower than average prices and not the quality of our service. If you have already received a quote elsewhere then let us know and we’ll do our best to beat it, enabling you to comply with the regulations and keep your valuable staff or tenants safe as well as reduce your testing costs. We are able to offer a discount charges for local companies in the greater Reading area to reflect our lower travel costs, just give us a ring to discuss your needs.
" We used ACE Testing to carry out quite extensive PAT testing across the whole of our College. The team provided to be very reliable and efficient and they did not interfere with the working life of the College. For your personalised PAT testing costs contact us today. Looking for low pat test prices? Our PAT testing charges and electrical pat testing cost may appear to be cheap but come with a quality service. Keep your annual PAT testing costs down - remember we apply local discounts to our normal pat testing price guide. Low cost PAT testing prices 2019. We operate across Reading, Thatcham, Newbury, Bracknell, Basingstoke, Wokingham, MaidenheadAscot, Windsor, Guildford, Swindon, Abingdon and Slough areas.